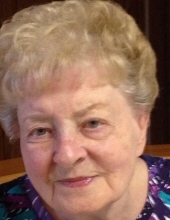 Anna Fischer, nee Rill, age 88, passed away peacefully at her home on November 27th. Anna was the loving wife of the late Franz; dearest daughter of the late Theresa and Paul Rill; beloved sister of the late Paul and Christian Rill. Anna was a former member of the friendship club at Our Lady, Mother of the Church. Visitation Friday from 4:00 p.m. until 8:00 p.m. at Cumberland Chapels 8300 W. Lawrence Ave., Norridge, IL. Funeral services will begin at 8:00 a.m. on Saturday, at the funeral home, and will then proceed to Our Lady, Mother of the Church for Mass at 9:00 a.m. Interment to follow at St. Joseph Cemetery. Info 708-456-8300. To send flowers or a remembrance gift to the family of Anna Fischer, please visit our Tribute Store. "Email Address" would like to share the life celebration of Anna Fischer. Click on the "link" to go to share a favorite memory or leave a condolence message for the family.